2012 New Features to come | 2013 Price, Ratio, DB Updates | Coming Soon? It was then re-founded on April 4th, 2003. The guild was named after the guild founder’s Neopet “SpankaroonieTwo” the meerca who was in first place on the reading list for a very long time. It all started with me! S2 was soon to become the leading guild centered around books, with membership numbers mounting up to several thousand members. Rumor has it that the guild was even featured in Issue 21 of the Neopets Magazine. 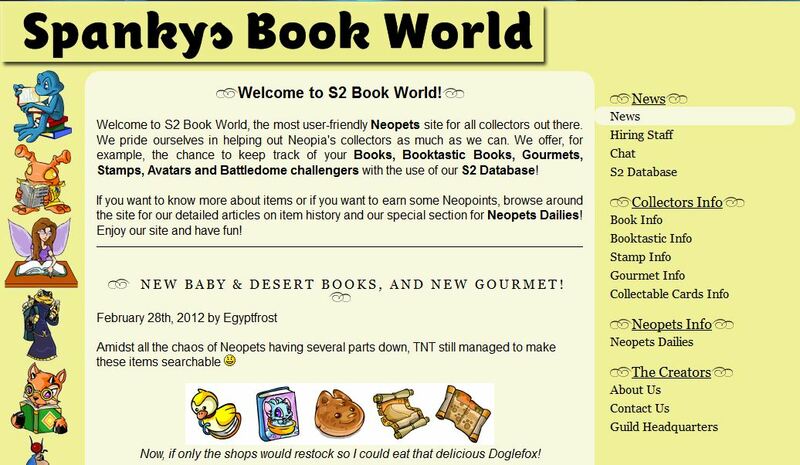 The Key feature was of course the book database, later to be augmented by sections for Gourmet Foods, Battledome Challengers and Avatars not to mention Booktastic Books and Stamps. On July 28th, 2007, one of the first upgrades was introduced to the database, the initial version of the import feature. You were now able to import your Books, Booktastic Books and Gourmet Foods to the database. Via the Forum, in the Chat Room as well as on the guild page in Neopia to mention only a few general possibilities. The guild supported their members reading projects via “Silent Auctions” and special book deals which active members (Super Muppets and above) were able to participate in. Donations from guild members to the guild account, be it books or neopoints by buying from Spankaroonie’s shop, helped to fund such events. Those auctions have been put on hold for S2 due to the changes in Neopets Rules. In February of 2009, the guild suffered a serious setback when several key members found their accounts hacked and stolen. The old website was affected from these hacking’s as well. As a consequence the council stopped being involved in Neopia as well as guild matters. 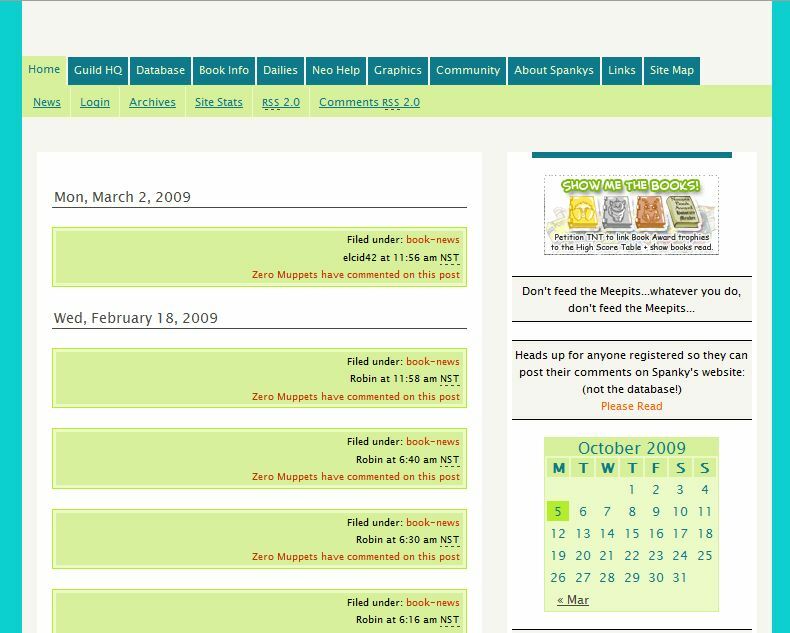 The old Spanky’s Website was shut down and the guild became inactive to the point, that the former guild leaders thought about shutting everything down. Thankfully those sad times took a quick happy ending turn. Having been a long term member of the guild and having helped out on the old site with suggestions, Andulien wanted to bring the guild back to it’s old flair. Starting from scratch the site was rebuilt anew. 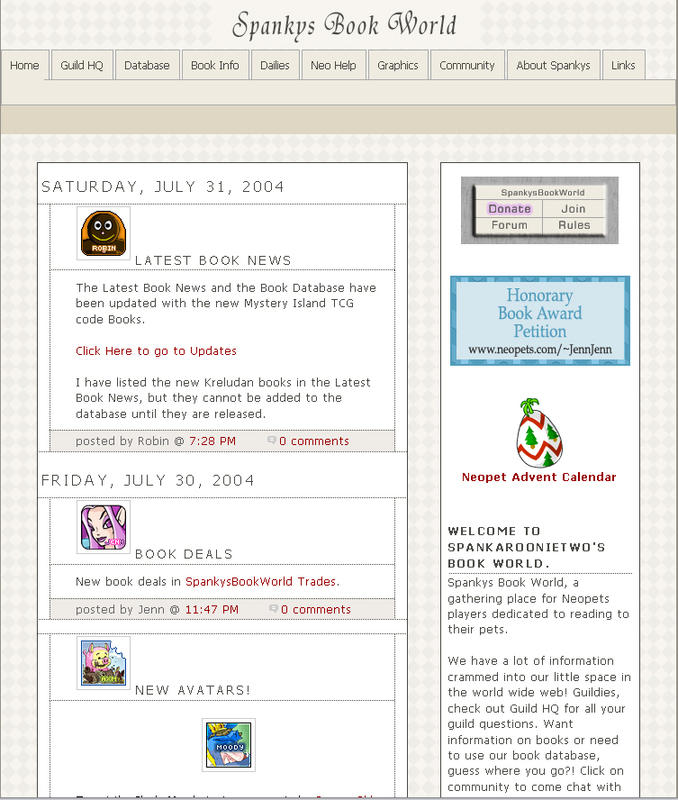 As of January 4th, 2010, the new site was officially opened, and the guild was re-named S2 Book World. During the first month, the databases were completed, the basic functions were available, and the new items we’re able to be added. 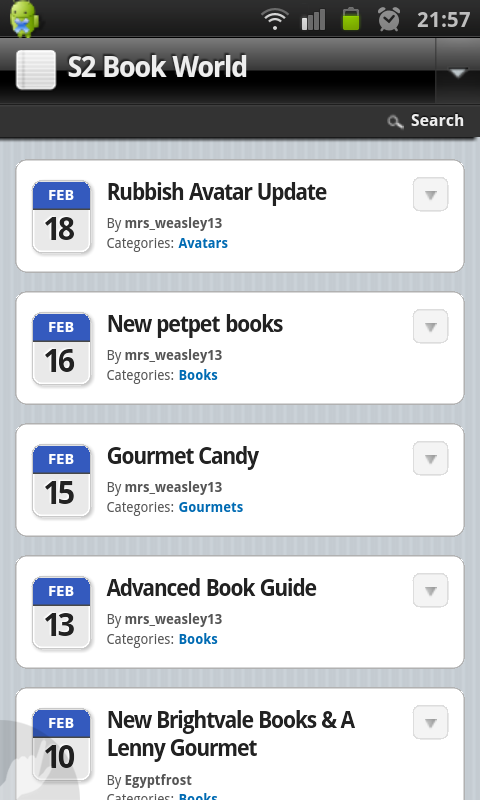 More new features were added in a fast pace already on the second day of the new start, including the page on missing items, and seeing which books your pet couldn’t read. By the end of January the S2 team had a Big Announcement: the import feature was finally released! The next site version looked wayyy better. During January and February of 2010, TNT had just started catching up on the thousands of items that had not been released until this point. This made for a huge amount of new items that needed to be added to the newly completed database. It took several more months to get caught up on the missing item ID’s and repricing the several thousand items in the database. Once everything was caught up on the S2 database, the work on content was started to bring our members new information that related to collecting books, booktastics, gourmets, stamps, avatars. In November of 2010, the “View others” feature was added. With this Database addition you are able to check what other collectors still needed, or show your friends what you still needed. In December of 2010, a new feature was added that showed you exactly how many items you still needed to reach the next trophy (or your first). This started to be a great incentive to collect more! The start of many many new features. At the beginning of January 2011, the Database got another update in style. 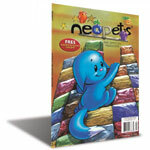 The Neopets Search Icons for Shopwiz etc. were added, to make it easier for members to search for items they still need. Around the same time, the avatar import feature was added to the S2 database, making it easy to see what avatars one already has and still needs. Throughout 2011 many new features were added to the S2 site and database. On February 26th the Export feature was added. From here on out members were able to export their needed item lists, and display them on their pet pages. If you still had a slower Internet connection, or just couldn’t wait for the database lists to load, you could hide DB Pictures as of March, 2011. The view of a full Album has been available since almost the new beginning of S2, but in March of 2011, S2 was the first site to offer an interactive view of your stamps in the stamp album in the S2 database. In May of 2011 a database for collectable cards was created. The site was given another overhaul, and the menu was completely redone. Hip hip hurray for structure. Hiding retired gourmets in the database is another feature that was added in October of 2011. With so many changes happening in 2011, and the site growing a lot, the year quickly came to an end. At the end of June 2012 it was finally time for a new feature to come. The Database was going to experience a new addition to it since May 2011 with the Collectable Cards. Newly added where the Game Trophies. These could also be seen now in the newly create Trophy Cabinet, which was closely build after the Neopian one. S2 Bookworld experienced during the summer of 2012 another exciting moment. 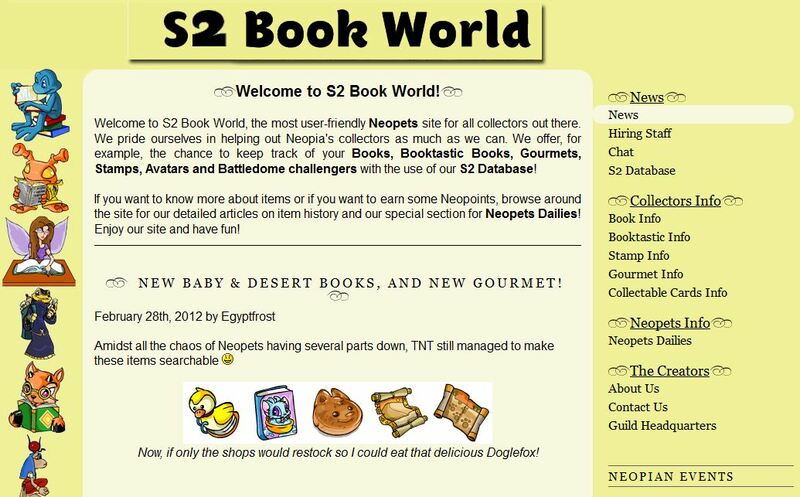 On the 1st of October, 2012, S2 Bookworld was put up on Neopets as one of the few with the privileges of an official Fan Site. After this everyone was able to freely talk about the S2 site on Neopets. After having to sadly retire our SSW feature due to a new structure on Neopets that prevents off-site linkage, we had to remove the SSW Search throughout our Database. We did however not want to leave the year on this sad note, and thus added a new little feature to bring all members closer to our Database. The full user base got for a first time a view into the behind the scene works of the S2 Database. Users were able to see our Missing ID pages for each section, as well as getting a little button on their “Need” list items which were missing an ID. Another year has passed and it passed fast. None the less the S2 team was able to pack in a lot of effort into the S2 Site and DB. With the support of the users we were able to improve the S2 Book World site even further. Already in January the first features were updated and added to the S2 Database. With this update the Trophy section had received all Trophies that you could obtain for your Users Lookup Page. Now everybody can track all Trophies from Neopets on S2 and see which ones are still available to get. But we didn’t stop there. In March the S2 Database receive a complete overhaul of the Menu, so that navigating through the DB would be easier. The old Menu was just a very long list. With the new Menu all lists have been categorized and grouped together for a better overview and navigation. At the end of March then we finished up another much requested feature. The DB users wanted to see their stamps that they have collected already in the respective stamp album. As this has been much requested we fulfilled this request to everybodies joy. March has been quite a month, the menu overhaul, the stamp album view in the DB and now an Estimate Price until the next trophy is reach. Now everybody in the DB is able to get a rough price estimate on how much it would cost to reach the next trophy. You currently need 2 (est. 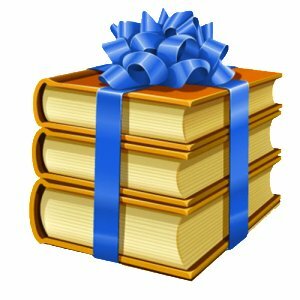 700,000 NP) Booktastic Books to reach the Gold Trophy. Skarvat has read 122 Booktastic Books worth around 141,495,183 NP. The Neopian summer came and in September a new content page was added, the Game Ratios Page! On this page you can check up on all those favorite Neo-Games on how much points you need to earn 1,000 Neopoints. Well, the year was quite long but there was still one last event that was quite a happy one for S2 Book World to celebrate. On the 21st of December 2013, the 500th Post was made on our News Page. And on these great News, this awesome year is coming now to an end. Get ready for next year!!! There is probably a new secret project in the works now again…stay tuned for what is coming up next…hehe. Until then, feel free to join us in the chat room. It is a fun place to be. The S2 database and the S2 website offer everything you need to help you to share and enjoy the experience of playing Neopets (and it will keep improving!!!!). If you have memories of the early days of S2, please contact someone on our website team and let them know about anything you’d like to add to this page.